I saw this on Instagram and Facebook and LOVE the message! In 2015 I plan on running 15 half marathons. In 2015 I plan on completing the New York Road Runners (NYRR) 9+1 program for guaranteed entry into the 2016 NYC Marathon. 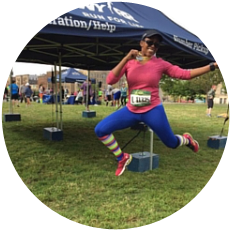 For a person that just ran her first half marathon this year, running 15 next year seems ambitious but I’m ready for the challenge – there’s no turning back now! Why 15 half marathons in 2015? Well I ran 14 races in 2014, which was great, but I’m ready to push myself a little harder next year. I feel like I have gotten into a pretty solid routine with my running which wasn’t always the case this year. Because I’m doing so many half marathons, I’ll be in a continuous training cycle all year which will help hold me accountable. I ran 560 miles this year and I’m sure I will double that in 2015 (more on this below). What is the NYRR 9+1 program? Basically you run 9 NYRR races (any distance) and volunteer at one race and you get guaranteed entry into the NYC Marathon for the following year. Luckily for me, NYRR offers a few half marathons throughout the year so completing a NYRR half marathon counts toward my half marathon goal and the NYRR 9+1 program. How do I plan to stay on track? I’m pretty organized so I like to write down my training for the week on my work and home calendars. For Christmas I received the Believe Training Journal by Lauren Fleshman. I skimmed through it today and I think it will be a great tool for me, while also giving me great doses of motivation. I will also focus a lot more on nutrition next year. Drinking enough water has never been a problem for me (I love water!) but there’s always room for improvement concerning the types of foods that I eat. I also need to nail down my fueling for long runs. Right now I keep alternating between gels and chews but do not have a favorite as of yet. I’m also taking part in the Run the Edge challenge to run 2,015 miles in 2015. Actually, I’m splitting this with a partner so I’m committing to run 1,0007.5 miles. This is about double my mileage from 2014 but I know I can do it! Do you have any goals for 2015? Whew! Best of luck to you on your goals for this year! 15 half marathons in a year would be awesome, and that's a whole hell of a lot of mileage, especially if you're planning on doubling it! Thanks so much Farrah! I have my first receive the year in a few weeks and I hope it's not too cold on race day! I keep a water bottle in my gym bag, my car and at my desk at work. It's just a constant reminder to me to drink water throughout the day, not just when I'm exciting.